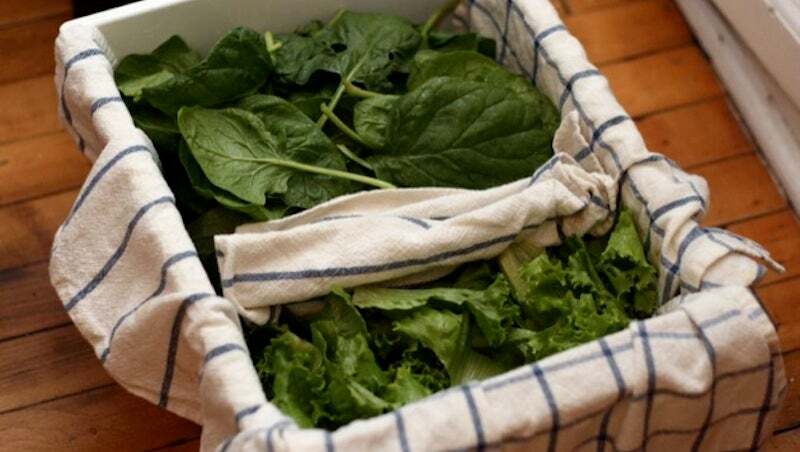 You probably already keep lettuce and other greens in the crisper, but if you line that drawer with towels, those greens will stay fresher longer, and they're just a handful away from quick salads or other dishes. Here's how (and why) it works. Image from The Paupered Chef. First, wash out the crisper drawer. Then line it with cotton dish towels that will absorb excess moisture from the greens. Wash and dry your greens as soon as you get them. This bath towel method we've described before works well, or you can use paper towels for the same effect. Then, just toss them in the towel-lined drawer, and you're all set. The towels will absorb moisture and help keep the greens dry, and the cool air will keep them from rotting as quickly as they would in a plastic bag, in direct contact with condensation. As you use them, stir the greens from time to time, so they don't settle or collect moisture. You can even use another towel to create barriers in the bin so you can store multiple types of greens. Since you've already washed the greens before storing them, salads are super quick — just pull a handful out of the fridge and toss it straight into a bowl, or into whatever else you're making.